You should put this on your Black Friday shopping list if a low-cost brokerage account is also what you have on your mind. Firstrade (my Firstrade review), an online discount broker that I talked quite a lot on this blog, is going to have a Black Friday Early Bird Promotion from November 28th 7:00 AM ET to 1:00 PM ET. 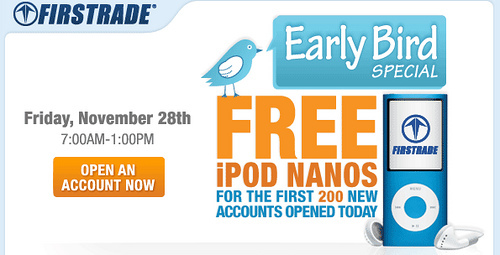 If you among the first 200 applicants to open an account with the broker, you will receive a free 8 GB iPod Nano. If the initial deposit is withdrawn or the account is closed or transferred, the value of the Promotion Reward ($150) may be deducted from the account. BTW, speaking of broker promotion, the $50 bonus from TrakeKing is still available. You can get the bonus if you open an account before this Sunday, November 30.